- ATA conducts comprehensive tire blow-out testing. Past articles in The Expert have described the use of the global positioning system (GPS) in the performance testing of motor vehicles and in the 3-D surveying of bridges. New uses for the versatile technology continue to suggest themselves almost daily. Earlier this year, ATA used its growing inventory of GPS equipment in our most elaborate use of the technology to date. A program of on-the-water testing was prompted by product liability claims against the retailer of a multi-passenger, inflatable ski tube. The plaintiff alleged that failure of a tow point, where the ski rope attached to the tube, had resulted in the tube's unplanned separation from the powerboat that was pulling it. After separation, it was claimed, the tube had careened into a dock at the shoreline causing undeniably serious injuries to two teenaged girls on the tube. Separate from the fact that the plaintiff had tied the ski rope to a handhold on the tube rather than to the yoke which was the designated tow point; the plaintiff's description of the tube's trajectory after the alleged separation seemed unlikely. However, given the dearth of published data on the hydrodynamic characteristics of ski tubes, it was impossible to authoritatively reconstruct the tube's behavior solely by mathematical analysis. To get the data needed to properly assess the plaintiff's claims about the tube's behavior, an exemplar ski boat and tube (the subject tube was discarded after the accident) were acquired, and a test program was planned. The boat and tube were each equipped with a GPS receiver to track their separate movements, and a load cell was employed at the ski rope's attachment to the boat to monitor tension in the rope. In addition, a remotely controlled release was rigged at the tube-end of the ski rope to permit the alleged separation to be triggered at points of interest during the tests. Tests were conducted in the range of boat speeds described by the plaintiff with the tube weighted to simulate the passenger load at the time of the accident. Turns of various sizes were executed; small radius turns described by the plaintiff and larger radius turns limited by the relatively narrow width of the lake where the accident occurred. Two ski rope lengths were tested; that described by the plaintiff and that recommended by the tube's manufacturer. The tests confirmed that the plaintiff's description of the accident and her claims about the tube's behavior were at odds with the laws of physics. Separation of the tube from the ski rope was clearly not the proximate cause of the accident. Testing showed that the tube's speed diminished so rapidly after release that, if the tube had struck the dock after a separation, the separation point was necessarily so close by that the tube was already on a path to being towed directly into the dock. In view of those test results, the plaintiff chose to settle the case without going to trial. When evaluating product safety, it is incumbent upon a reasonably prudent manufacturer, distributor, and retailer to apply the following accepted principles of safety analysis to insure that the products are reasonably safe. 1. Establish and observe a written safety policy. This policy should emphasize commitment to safety. In writing, it will insure all employees obtain clear guidance on safety issues. The policy should set forth a method for discussing safety responsibilities. 2. 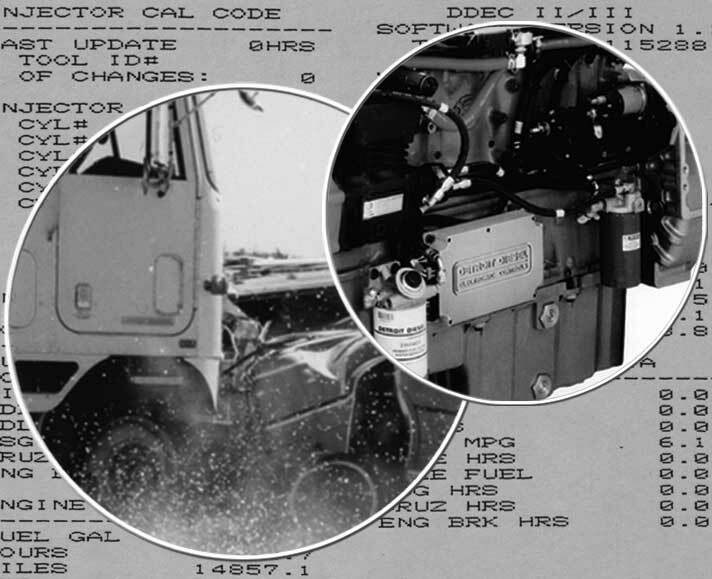 Adequately identify and evaluate product hazards. A hazard is the inherent capability of a product to do harm. Manufacturers, distributors, and retailers must review the potential injury-causing energy and evaluate severity and foreseeability. 3. Perform an adequate design review integrating product hazards, the environment and foreseeable consumer use. Once hazards are identified, the reasonably prudent manufacturer/distributor/retailer must consider the conditions or use under which the injury-causing mechanism (hazard) can cause harm to the user. Analysis of the environment where the product will foreseeably be used, especially in light of product promotion, is critical in discerning how the consumer may foreseeably use the product, even if it is not the use intended by the manufacturer. The product must be reasonably safe prior to distribution in commerce. If it is not possible to eliminate the hazard, the reasonably prudent manufacturer, distributor, and retailer must take steps to guard against the hazard, to adequately inform users of the danger inherent in the product, and to motivate them to avoid that danger. 4. Monitor the safety performance of the product after sale and use and take corrective action where necessary. Once the product is distributed to consumers, a responsible manufacturer/distributor/retailer must determine where injuries can occur, or if a product defect (including lack of adequate labeling and safety information) could create injuries. The Consumer Product Safety Commission provides national injury estimates through the National Electronic Surveillance System, better known as NEISS, to assist in monitoring safety performance. Where corrective action is needed to substantially reduce or eliminate injuries, consumer notification and additional safety measures must be implemented to insure consumer safety. 5. Develop adequate warnings and training to motivate consumers to understand and avoid dangers. A good warning can give consumers the information they need to protect themselves from injury. Under the industry developed guidelines established at ANSI Z535.4 standard, manufacturers and distributors have the information required to develop a warning that includes a signal word (Danger, Warning, Caution), a pictorial identifying the hazard, instructions on how to avoid injury and the consequences for failing to act. While correcting product defects is the primary goal, warnings are essential in a reasonable safety program. A key precept of safety analysis concerns products with inherent capability to do catastrophic harm. In priority order, the duty of a reasonably prudent manufacturer is to eliminate the hazard, or, if this is not possible while preserving utility, guard against the hazard. At a minimum, the manufacturer, distributor, and retailer must properly inform users of the dangers inherent in the product and motivate them to avoid it. Manufacturers should ensure that their product is properly designed and properly manufactured to avoid injury, environmental damage or property damage. To avoid liability, their products need to be properly engineered to ensure that they are designed to be safe. If a manufacturer does not do some sort of safety analysis to identify and hopefully correct hazards, he will most assuredly be held liable if someone is injured. The method I use is applying the hierarchy for hazard reduction, it contains all of the elements that the designer must consider to reduce or eliminate the hazard. To identify a hazard and determine its relative risk, the probability and severity of the hazard must be assessed. A high severity hazard such as being struck by a meteorite from space has such low probability that you need not concern yourself. Conversely, a low severity risk such as stubbing your toe on furniture happens quite often but the severity is not worth taking action. Those hazards with high probability and high severity need to be addressed immediately. Once a manufacturer has identified a hazard with their product they must work to eliminate it or reduce the severity or probability. Also, the hazard should be identified and corrected before being placed on the market. Once the product is in the hands of the populace it is hard to retrieve it. 1. Implement a fundamental design change or substitution for a less hazardous design or material. 2. Install an engineered safety feature, an automatic safing device. 3. Install a safety barrier to prevent exposure to the hazard. 4. Provide Warnings for the end user. 5. Provide written policies and procedures on the use of the product. 6. Require or provide Personal Protective Equipment. Some or all of these methods can be employed to eliminate or reduce the hazard, generally the best method is number 1 and they decrease in effectiveness as you go down the list. The manufacturer should not hide behind the auspices of industry standards as complying with reasonable design. These are only minimum standards and they should at least meet them. Some of the standards I have reviewed are lacking good design and safety practices, although these standards are better than none. Good quality practices, including industry and ISO standards, are required. These are necessary to ensure the product is produced as it was designed. Defects in material or workmanship must be avoided in order to achieve a product free from defects. The manufacturer must maintain records and stay abreast of the current technology and methods of design, manufacturing and means with which their product may be used or abused. Determining foreseeable misuse of their product is necessary and important in steps 4, 5 and 6 of the hierarchy. I'm sure that most of our long time clients are aware of our test capabilities and experience. Keeping that in mind, I thought I would tell you a little bit about ATA's Model and Mock-up capabilities. Our custom model making and mock-up capabilities offer a variety of three-dimensional solutions. From product design, testing and marketing to courtroom exhibits, models take ideas and concepts beyond words to a visual representation. When it comes to designing and crafting models it is particularly important to keep your audience in mind. Who will be viewing the display? For what purpose is it being built? What do you hope to convey? Detailed pre-proposal interviews eliminate questions regarding scope, purpose, degree of detail, and material to be used. Size, fidelity and cost should always be considered before starting any model-making job. We are dedicated to our customer's needs, so the more information we gather on the front end the more pleased you will be with the final product. ATA's modern light manufacturing and testing facility allows us to work with a wide range of materials including balsa wood, plastic, steel and aluminum. From low fidelity model repairs to working scale, high fidelity mock-ups, we are your one stop shop. Prior to becoming the Laboratory manager at ATA, I was employed at the McDonnell Douglas/Boeing Space Station Division. At Boeing I was assigned to an engineering development operations team (E.D.O.) made up of master modelers from around the country. We built high fidelity models for everything from a full scale working Space Station mock-ups to high-speed wind tunnel aircraft models. It is this level of detail and experience that I proudly bring to ATA. I hope to be able to assist many of you with your projects. 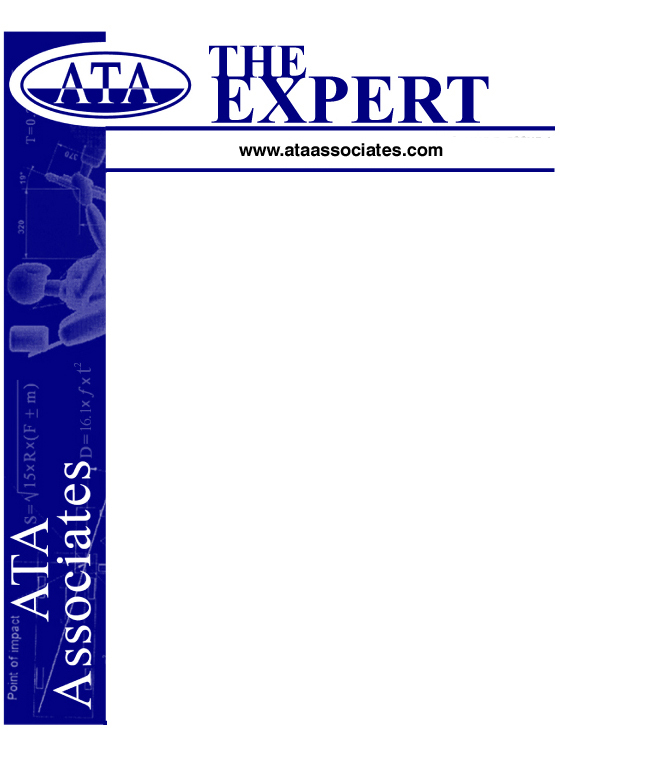 ATA Associates is a unique organization dedicated to supporting all types of product testing and evaluation. Although our core business is accident reconstruction, we have a qualified staff of engineers and safety experts that can investigate any type of failure analysis on just about any object. CEO and owner Robert “Bob” Swint has put together a team of investigators that take pride in their ability to produce thorough testing protocol. Biomechanics is a very specialized field within the engineering profession. At the heart of biomechanical analysis is a strong foundation of mechanical engineering with extensive knowledge of the human body as the system of application. In the case of an accident where injury has occurred, reconstruction becomes somewhat of an investigative and analytic matter. For the biomechanics expert, there are two sides of an equation to develop: engineering data and physical laws related to detailed injury description and the medical facts. In most situations, engineering reconstructionists other than the biomechanicist determine the forces and torque, energy and time sequencing associated with the vehicles involved. On the medical side, surgeons, radiologists and other specialists clearly define the extent of the injury and the prognosis for recovery, based on experience and knowl edge of the healing process. Medical experts can discuss the probable cause as it relates to the type of injury and based on their experience of similar cases. The missing piece supplied by the biomechanics expert directly relates to the magnitude and directions of forces and energies to the nature of the tissue damage. For example, bones in the human body differ in their fracture resistance and manner depending on their shape, age, function and loading pattern at the time of impact. The physical properties of bone, muscle and other connective tissue vary greatly throughout the body. Since they are viscoelastic in nature, they respond with greater stiffness with a higher rate of loading. The assigning of causality based on the appearance of similarity to past experiences may not at all relate to the mechanisms causing the one currently under examination. What seems obvious as a cause may not be when a careful dynamic analysis is completed of the accident as it relates to the victim (not necessarily the vehicle) and its results applied to the structural properties of the tissue. PhotoModeler* is a software program that extracts 2-D and 3-D measurements from photographs taken in perspective. Using a camera as an input device and with specific parameters in the photos, PhotoModeler can extract unknown data. Using several vantage points or camera stations with common points in each of the photos taken of the scene or object, the software combines these common points and features into 3 dimensions. The marked points on the photos become measurable points, lines, or objects in a single, unified 3-D space. PhotoModeler can create both 2-D drawings or images and 3-D objects and models. It uses photographs from different angles and unifies them in 3-D space. 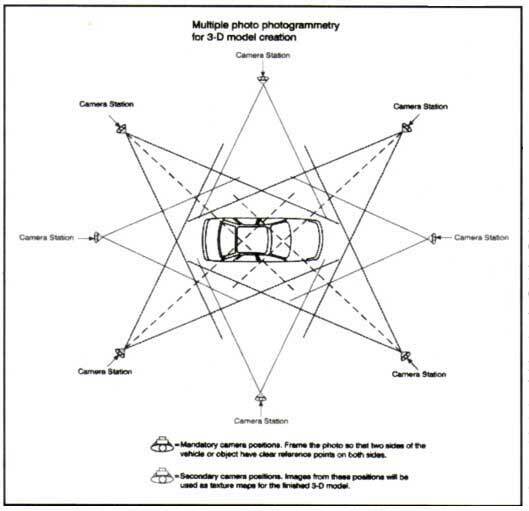 To survey or model an object (like a car), as many as five correctly positioned photos would be required to create the 3-D model. A front façade of a building may take as little as three photos. 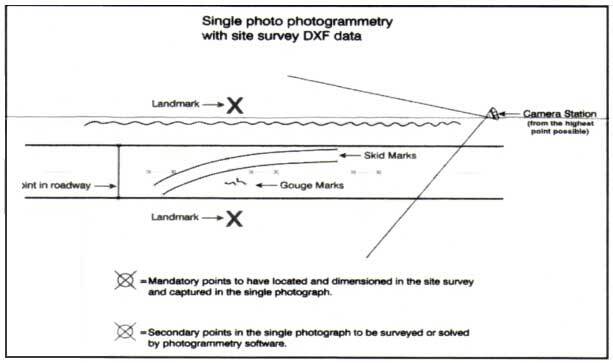 In some cases, when a digital survey has been taken of an accident scene, PhotoModeler can carry out some operations on a single photo of the same scene if sufficient control points are known. ATA has used PhotoModeler to measure distances and create drawings of accident scenes and vehicles. * PhotoModeler TM is a registered software program by Eos Sytems. In April and May of 2006, ATA Associates conducted a series of tests to determine the cause of a single-boat accident that occurred in 2003 on Louisiana's Lake Bisteneau. The boat involved was a late model, 17 ft. aluminum fishing boat powered by a 75 HP outboard motor. A passenger was seriously injured when he was ejected from the boat and was struck by the boat's propeller. In its testing, ATA examined the steering performance of the subject boat involved in the accident. An almost identical exemplar vessel and motor were also tested. After a day of inspection and rigging with electronic test instrumentation, each boat was subjected to a full day of in-water performance testing on the Cypress Bayou Reservoir near Shreveport, Louisiana. Items of particular interest were: 1) how the outboard motor's mounting location and orientation on the boat influenced its steering performance; and 2) how the motor's trim tab setting influenced steering. The influence of the motor's adjustable trim angle, relative to the transom, was also examined in tests which were conducted over each boat's full range of operating speeds. The Louisiana tests were just the latest chapter in a long history of boat tests conducted by ATA Associates. With ATA's founder and owner, Robert Swint, at the helm, the subject boat in this case was put through its paces in a series of tests that ranged from benign, low speed maneuvers to higher speed tests which culminated in anticipated, but nevertheless dramatic, losses of control. Though special care was taken to ensure Bob's safety in the latter tests, those tests were still not for the squeamish, nor for the boat operator who wished to stay dry. While the drama of the loss-of-control tests was reminiscent of the early, glory days of boat testing by Bob Swint, upon which ATA was founded, the Louisiana tests as a whole represented the great strengths of today's ATA. The tests were monitored and recorded by video cameras on shore and by miniature video cameras mounted on-board the boat. In addition, during each test steering wheel input torque, steering wheel rotation angle, boat plane angle, motor trim angle and the forward, lateral and vertical accelerations of the boat at the passenger's seat location were all measured electronically and continuously logged at the rate of 500 samples per second. Boat position and speed, as determined by global positioning system (GPS) equipment, were also recorded, permitting a level of post-test performance analysis that would not have been dreamed of in ATA earliest days of boat testing. Test results demonstrated and quantified the strong influence of the outboard motor's trim tab setting on boat steering performance. The lesser influences of trim angle and the improper mounting of the motor on the subject boat were also quantified. These observations led to the conclusion that an improper trim tab adjustment, and to a lesser extent an un-centered mounting of the motor, made the subject boat inherently unstable and dangerous if the steering wheel was released, even momentarily. ATA has developed and refined methods required to create admissible night photographs and video footage for presentation as evidence or visual aids in the litigation process. Professional quality equipment is a key ingredient. Film cameras are preferred over the newer digital formats because film shows more detail and clarity in shadow areas and low light situations. A medium format still camera demonstrates distinct advantages over the smaller 35mm or digital formats and has accessories useful in night photography. The larger film provides better quality enlargements. One major advantage of a professional quality medium or large format camera is the interchangeable film back. A film back using an instant color film may be used as well as one loaded with standard color print film. Proper exposure of night-time photos involves long shutter speedsï¿½from one second to ten seconds or more, depending on the film used and the physical conditions. The advantage of using an instant film is on-the-spot confirmation of the proper exposure and the lighting situation before exposing the color print film. The case expert can immediately confirm that the instant film exposure faithfully depicts scene illumination at that moment. Once the instant photo is approved, the color negative film is exposed. Immediate confirmation of scene depiction using instant film lessens the necessity for a re-shoot because of improper exposure of the color negative film. 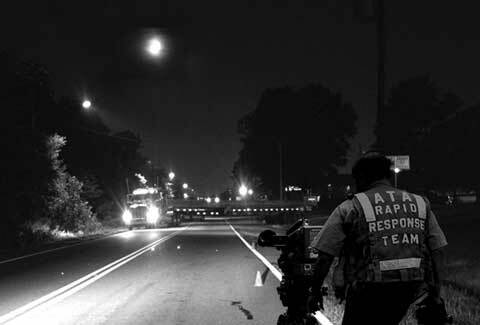 Night photo shoots can be very involved and time consuming. Personnel such as photographers, experts, witnesses, lawyers for both sides, and police for traffic control, may be involved in the shoot. Physical conditions such as the time of the month (moon phase) and weather also may be important factors. Once on site, the camera (either still or videotape) must be positioned at a viewpoint approved by the case expert. The lighting should be as accurate a re-creation of the original event lighting as possible. The viewpoint may be that of an approaching driver, a witness alongside the road or another person involved in the incident. Additional lights in the scene (street lights, stop lights, business signs, yard or security lights) should be compared to the original event. This information may be available from accident reports, depositions and witness testimony. The resulting color negatives are printed accurately for the approval of the expert who must testify that the resulting photo represents conditions as they were the night it was taken. These techniques have proven very useful in creating effective photographs and video footage of night lighting situations. They consistently produce accurate visual representations of situational lighting similar to that of the original incident. If you're interested, you can find a lively debate on the Internet on whether a front tire blowout or a rear tire blowout is more dangerous when driving your car. There is similar controversy concerning truck tire failures. While the dual rear axles and wheels on heavy trucks provide redundant traction and support in the rear, there is no redundancy with the individual wheels up front. You might think then that a front tire blowout on a truck would be a sure recipe for disaster. However, a study by a major tire manufacturer suggests that power steering can provide a truck driver with sufficient control to overcome the ill effects of a front tire blowout. 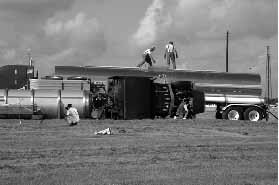 Such were the contradictory theories that ATA Associates, Inc. had to consider recently when reconstructing a truck accident involving a blowout. In October 2004, the left front tire of a 62,000-pound mobile drilling rig blew while the rig was traveling on a central Texas highway. Immediately after the blowout, the rig crossed the highway centerline and struck an oncoming car head-on, killing that car's driver. Marks on the road and other evidence at the scene clearly indicated what had happened. What was less evident was whether any practical, alternative reaction by the rig's driver had been possible after the blowout and if that alternate reaction would have changed the outcome. To answer those questions and to address the conflicting theoretical possibilities, ATA re-enacted the blowout portion of the mishap to actually observe and to quantify the post-blowout behavior of both the rig and its driver. The re-enactment was conducted in November 2006 on a closed course in a fenced-in parking lot. The mobile drilling rig, which had been involved in the subject accident and which had subsequently been repaired, was outfitted with electronic instrumentation to record its inertial responses during the test. Video cameras were also positioned at several locations around the test course and in the rig's cab to visually document the behavior of the rig and its driver as the staged blowout unfolded. 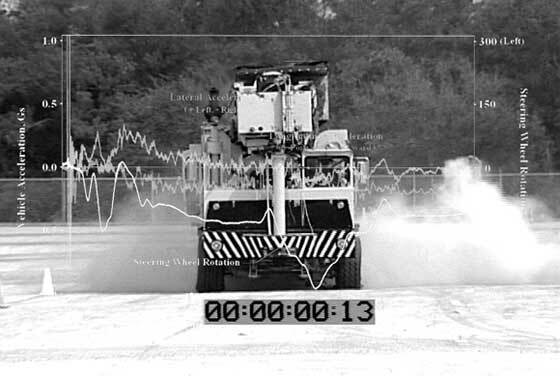 In those preparations, the test was similar to many other dynamic vehicle tests that ATA has conducted in recent years, but there was one feature that made this test unique. To initiate a blowout in the rig's left front tire while the rig was underway, the rig was equipped with a black powder mortar that had been specially designed and built for the test by M.E. Prescott, a movie special effects and stunt coordinator and one of many specialized consultants known to ATA. Prescott's mortar was attached to the rig's front axle and aimed to pierce the inboard sidewall of the left tire when the mortar was fired at the driver's command. The driving task in the re-enactment went to Phil Smith, an expert in truck driving and a frequent collaborator with ATA on heavy truck cases. After carefully coordinated preparations by Prescott, Smith, and the ATA staff, the re-enactment began. The initial test run was aborted when the top-heavy rig tipped precariously during a sharp turn as the driver and vehicle got acquainted. Once that miscue passed without harm, a second run to the 35 mph test speed was made and the mortar was fired. A thunderous boom and big cloud of smoke were unmistakable signs that the mortar had been fired. The tire deflated immediately after the mortar's blast pierced not only the inboard sidewall but also the outboard sidewall of the rig's massive tire which was rated to carry 12,300 lbs. The rig veered to the left as it had in the subject accident with the driver's steering inputs having little effect as it rolled to a stop 450 feet later. Post-test analysis of the collected electronic data revealed that in the first second after the blowout, the rig's lateral acceleration was erratic but generally to the left despite the fact that initial steering input was to the right. In the next second, a steering wheel rotation of 150 o to the right brought the lateral acceleration to zero, but as soon as the steering wheel was turned back towards the straight-ahead position, the rig again accelerated to the left, reaching a maximum acceleration of 0.3G to the left at 2 seconds after the blowout. Sustained steering inputs to the right, beginning 2.5 seconds after the blowout and continuing thereafter, decreased the acceleration to the left, but a survey of the rig's path after the blowout showed that the steering inputs to the right never arrested the rig's persistent movement to the left. In sum, the test suggested that in the central Texas accident the driver had little control of over his vehicle's path once the front tire blew. A devastating explosion occurred two years ago at BP's Texas City refinery, causing 15 fatalities and over 175 injuries. This well-publicized accident will force changes in refinery and chemical plant operation and safety. Nearly 20 years ago, a similar shock from a string of major chemical accidents in the U.S. and overseas galvanized the process industry to improve safety, and prompted new OSHA and EPA regulations at that time. BP's tragic explosion was traced to a startup mistake in the refinery's gasoline octane-boosting isomerization unit overfilling a distillation tower and attached blowdown drum with highly-flammable liquid hydrocarbons. The blowdown drum vented through a stack directly to atmosphere without a burning pilot flare, so that the equivalent of a tanker-truck of highly-flammable liquids and vapor spilled back down to the ground. A flammable cloud dispersed rapidly, running beneath temporary trailers with personnel inside planning work on a nearby unit. The vapor cloud was ignited by a running diesel pickup, initiating explosions and fires that swept through the entire area. The US Chemical Safety Board (CSB) immediately began a careful and exhaustive investigation. Their official findings were just released, and emphasized organizational and safety deficiencies at all levels in the BP Corporation. CSB asserted that cost-cutting, production pressures and failure to invest led to a progressive deterioration in safety at the refinery. Investigators found evidence of infrastructure and equipment in complete decline, fatigued workers, a chronic lack of preventative maintenance and training, and a prevailing culture that accepted cost reductions without challenge. Even more compelling was CSB's rendition of BP's own internal audit findings before the accident detailing widespread non-compliance with basic health, safety and environmental rules, and poor implementation of safety management. CSB calls for changes. Within refining and chemical companies they expect a new standard of care for corporate boards of directors and CEO's throughout the world with boards examining every detail of safety programs to ensure that no terrible tragedy like this occurs. OSHA was challenged to step up their inspections and enforcement of Process Safety Management (PSM) standards at refineries and chemical plants. Industry should expect more highly-technical, complex, and lengthy inspections designed to uncover the sorts of systemic shortcomings highlighted in the recent BP investigation. For assistance in implementing robust process safety programs, or for careful, forensic investigations of process incidents, contact Robert Swint at ATA Associates (Houston). Bob Swint, ATA CEO and accident reconstruction expert, went with a local KHOU Channel 11 TV reporter to evaluate intersections most prone to automobile wrecks. After researching five years of data from TXDOT, ten of the most dangerous crossroads in the Houston area were pinpointed. Each spot was visited and Swint pointed out the traffic flow problems and dangers of each intersection. Some of the problems he observed were narrow intersections where heavy truck traffic flows come together along with prolonged times for the clearing of truck traffic; uphill inclines leading to limited sight distances and short distances for traffic to change lanes. Skid marks on approaches to some areas indicated sudden and unexpected traffic problems. Swint said that at all of the top ten most dangerous intersections, as well as anywhere else, drivers need to beware. The spot aired on KHOU 11 News on November 11, 2013. Click KHOU TV Dangerous Intersection Reports to view the interview and accompanying transcript. It is no longer uncommon to find accidents that have been captured on surveillance video cameras located at nearby businesses. Bearing this in mind, ATA has placed a heightened focus on the study of surveillance video to help answer reconstruction questions about the speed, time and distance of a subject of interest. For the purpose of answering the questions above, the usefulness of the video varies greatly on the video system installed. A time stamp is usually embedded within each frame of the video. In order to determine vehicle speed, it is first necessary to know the frame rate (speed at which the video camera is recording the scene). Video cameras operate at 30 frames per second but that may not be the rate at which the video is recorded to an electronic file. Businesses often have more than one camera at their facility so it is necessary to have a master program to control the cameras. A software program and a bus (mechanism to communicate between the cameras and software) is in charge of recording. The company may, for example, have camera #1 record to the file at five frames per second while camera #2 is sending its information at 15 frames per second. Perhaps they have camera #3 sending information only when it is triggered to do so (such as when a gate opens or closes). Complicating that is that the frame rate may not be constant throughout the recording. The reason is that the data from each camera is sent to the controlling computer via a BUS communication system which transfers data between components. Because the information from each camera cannot reach the computer at exactly the same time, there are delays which can cause drops in the frame rate for a particular camera. Determining speed from wheel base movement and effective frame rate. Once all of this is understood, frame-by-frame analysis of the objects of interest in the video are carefully examined. Location of fixed objects such as poles or building edges helps with determining distances traveled within a number of frames of video. 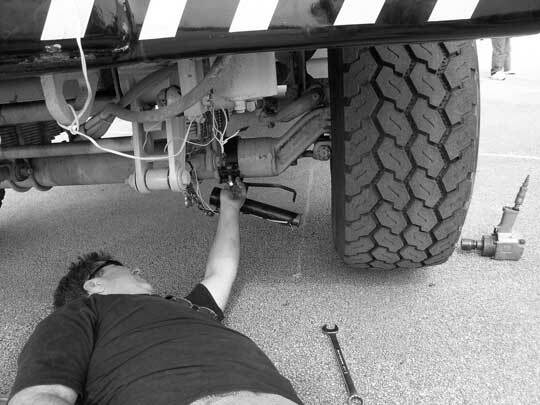 If no such reference exists, sometimes it is possible, depending on the angle of view, to place an artificial vertical line in the video at the front axle of the vehicle of interest, then count the number of frames until the rear axle crosses that fixed artificial vertical line. Knowing the wheelbase of the vehicle and the frame rate, then the speed of the vehicle can be estimated to a reasonable degree. ATA assisted in the defense of a major trucking company that was accused of making an unsafe right turn, typically referred to as a â€œsqueeze playâ€�. 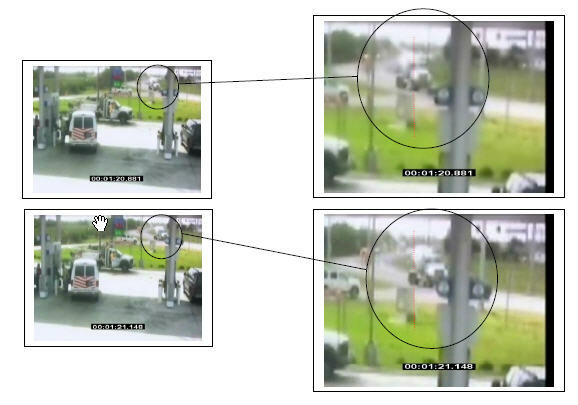 ATA broke down rough surveillance video footage to establish the speed of a motorcycle that was attempting to beat a tractor trailer into a right-hand turn at a roadway intersection. 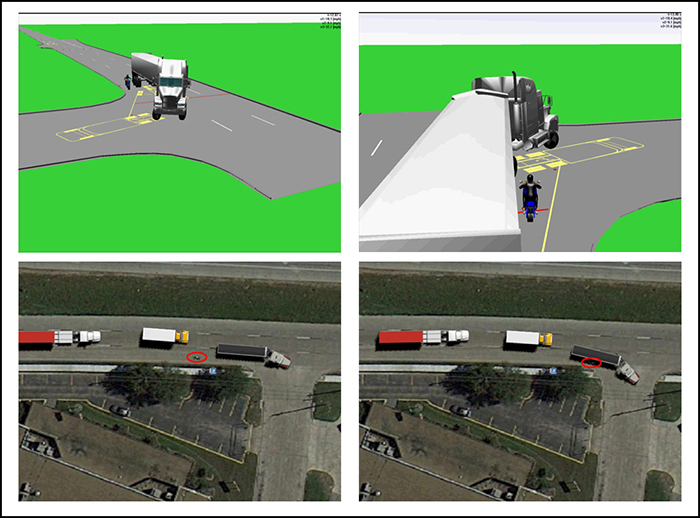 The process of â€œCamera Matchingâ€� was then used to establish locations in the three dimensional space of 3D Max Software of the vehicles from their positions in two-dimensional space (surveillance video); thus producing a 3D animation which accurately displayed the relationship between the two vehicles during the course of the incident. The motorcycle was established to be travelling at an excessive speed as it approached the intersection, and was found to be 75% at fault, resulting in a no reward judgement. The plaintiff then appealed this decision, which was upheld by the Fourteenth Court of Appeals.